Things are crazy busy here with family and the holiday but I want you to know that I care about you. I hope you don't mind a little re-post from last year. 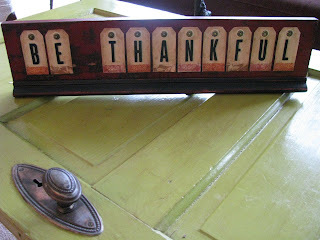 It's a quick little craft that you can make for Thanksgiving or modify it for Christmas. I thought it might be fun to make a little sign of the season, a visual reminder of what we need to be thinking. 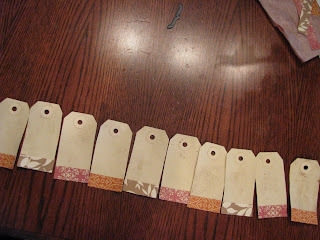 I started with little manilla tags and then added strips of fall colored scrapbook paper to the bottom. I wanted an aged look, so I took out my craft stain and rubbed it around the edges. (You professional scrapbookers would have probably used a different product.) When I was finished, I didn't really like the look. Luckily, the stain is water based so I gently rubbed a wet towel over the entire tag to even out the stain. Now I had the aged look I was after. 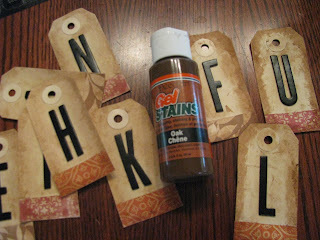 You could probably achieve this same look by staining the tags with tea or coffee, if you have it. (The left side is the "after" look) I added some self adhesive scrapbook letters. I couldn't find any in black, so I bought some blue ones and spray painted them before taking them off the page. At this point, I could have used ribbon to string all the tags together to make a cute banner, but I had other plans. I cut a piece of 6" wide wood and a piece of trim molding to the length I needed. 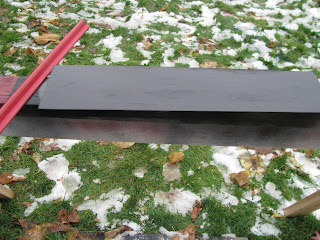 I painted the wood black and the trim red. Once dry, I did a second coat of the opposite colors. 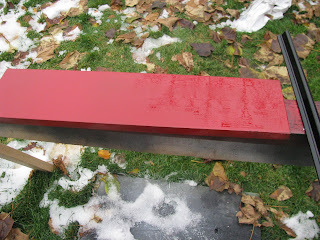 Then I sanded both pieces to reveal the original paint. I glued the trim molding onto the wood and then used painters tape to make a straight edge for placing the tags. 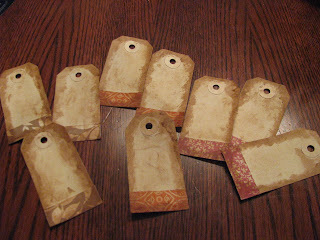 I adhered the tags using spray adhesive. For the final touch I nailed furniture tacks into the tag holes. Very cute, Joy! 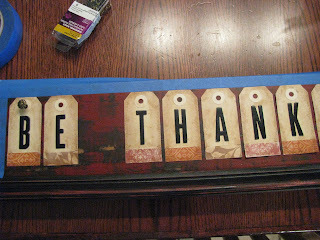 I was thinking nails or tacks to add to the tags on the wood. This is a great idea for all those little pieces of scrapbook paper that I really hate to throw out. Such a creative idea....love it! I love the sign. 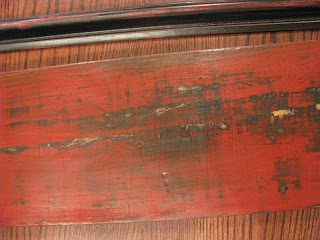 The red and black is how I'm thinking of painting my desk and hutch that I just got. Have a Happy Thanksgiving! So cute and easy...my mind is spinning with possibilities now. Thanks for sharing. I must have missed that last year -- adorable! Your blog is full of inspiration! Thanks so much for the time it takes you to do it. I know blogging is time consuming! Happy Holidays! P.S. The mantle you are making for the fireplace is GORGEOUS! I can't wait for the "after" photos! I love it! I have got to get a sander one of these days. Happy Thanksgiving Joy. Your Post has given me some inspiration for Thursday's table. Thanks so much! You are so talented! Great project! Love the aged effect and the red and black together. I'm a new-ish follower and have enjoyed your past posts :) Fun blog full of inspiration! This is awesome!! I simply love it. Great job.